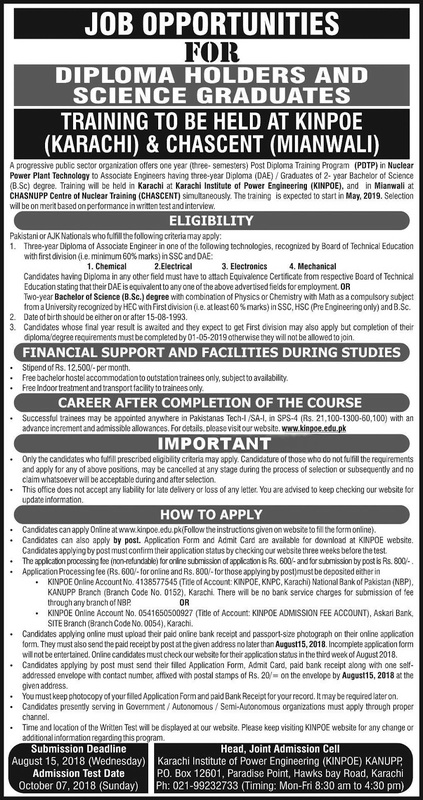 For Detail & Apply online visit at kinpoe.edu.pk. Test: 7th October 2018, Sunday. Monthly Stipend: PKR. 12,500/- per month for the duration for training. 2 Years Bachelor in Science Degree (B.Sc.) Degree with Physics or Chemistry in combination along with Maths as a compulsory subject. Last Date to Submit Application. Last Date is 15th August 2018, Wednesday.